We're a fully licensed operator covering all sectors, hotels, hospitals, offices, restaurants & universities. KeyHygiene is a valued part of the Keywaste Group, a 100% Irish owned company. Our aim is to deliver to our clients the most hygienic washroom services and products. Our fully trained personnel provide a discreet, hygienic and hassle free service aiming to ensure that the experience of your customers and staff is always pleasant. We guarantee the highest level of service when providing an extensive range of washroom services suitable for any size and any type of business. Our sales team can arrange a washroom survey free of charge to offer recommendations for the most suitable products and flexible service arrangements tailored for the individual client. We pride ourselves in providing a personal customer relationship with each individual customer and are always on hand to answer any questions. We are a fully licensed operator and cover all sectors including hotels, hospitals, offices, restaurants and universities. 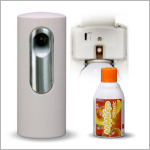 Not only do our Feminine Hygiene Bins ensure that your washroom visitors are provided with a safe and hygienic sanitary disposal facility, but they are discreet and simple to use. KeyHygiene Feminine Hygiene Bins are pedal operated, ensuring all unnecessary physical contact is removed whilst ensuring total discretion for the visitor. Our feminine hygiene service is both professional and discreet and is carried out by our trained personnel. All of our bins are clearly labelled with our waste permit code and company name. KeyHygiene Feminine Hygiene Bins are pedal operated, ensuring all unnecessary physical contact is removed whilst ensuring total discretion for the visitor, and are neutral in colour to suit all washroom decors. A modesty flap ensures no contents are visible. The Feminine Hygiene Bins have a capacity of 19 litres. 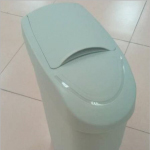 KeyHygiene's effective Nappy Disposal Bins not only offer a welcome convenience to your washroom visitors, but also have a massive capacity of 60 litres. They are fitted with an extremely easy to use pedal functionality for maximum hygiene and discretion and the built-in modesty flap ensures contents are not visible, containing unsightly waste. They lock away both smells and germs and providing superb odour protection. 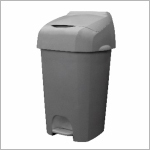 Our Nappy Disposal bins are contemporary and dynamic in design, and with their gloss grey colour finish they fit any washroom decor and are both discrete and unobtrusive. One simple action and the nappy is disposed and contained. All units are clearly labelled with our waste permit code and company name. Washroom odours can be problematic. Simply put, a clean washroom should smell clean. KeyHygiene's Air Freshener Units provide a bright, fresh and odour free environment, instantly creating a welcoming ambiance. Stylishly designed and simple to operate, KeyHygiene's Air Freshener Units look great on any wall, in or out of the washroom. The Air Freshener Units are battery operated and deliver 24 hour fragrance and odour control every day of the week. They are effective in rooms of up to 168 cubic meters, with metered spray doses of 15,22.5 and 30 minute intervals. 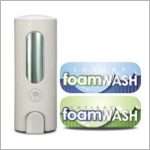 KeyHygiene's most luxurious foaming soap is extremely popular with washroom users – a little can go a very long way. Our high quality Foam Hand Wash will encourage better hand hygiene because one dose is enough to cover the hands thoroughly. Sanitary vending is now a dutiful offering for all female washrooms. It provides comfort and assurance to your customers and staff when the service is available to them. Our vending units offer a mix of tampons and sanitary towels for your female clientele. Our service instantly eliminates customer inconvenience, by removing the requirement of cash handling and stock holding of vending products on site. 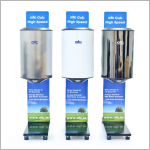 Our vending units are manufactured to the highest standard and are extremely robust and reliable. They are easy to install with a unique radical locking system. The combined coin acceptor and product drawer is situated at the base of the machine, maximising ease of use for your washroom visitors. 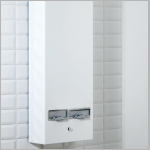 KeyHygiene's range of Hand Dryers provide the complete solution to all hygiene requirements in washrooms. Our range includes Automatic, Manual and Recessed Models that are suitable for many applications in pubs, hotels, restaurants, hospitals, nursing homes, shopping centres, sports stadia, leisure centres & offices. Our range of Hand Dryers are more energy efficient, promote cost savings, improve hygiene, are environmentally friendly and are easy to maintain. The High Speed Cub Hand Dryers are smooth and unique in design. They combine great drying performance with ultra-low energy use. They are factory set at 1150 watts with the heating element on and can be simply switched to 500 watt ambient by the installer or end user. This does not affect the air speed, which dries hands in just 15 seconds. The High Speed Cub is neat in size and modern in design and comes in three finishes, Stainless Steel, White and Black. © 2017 All rights reserved | Design by FWD.